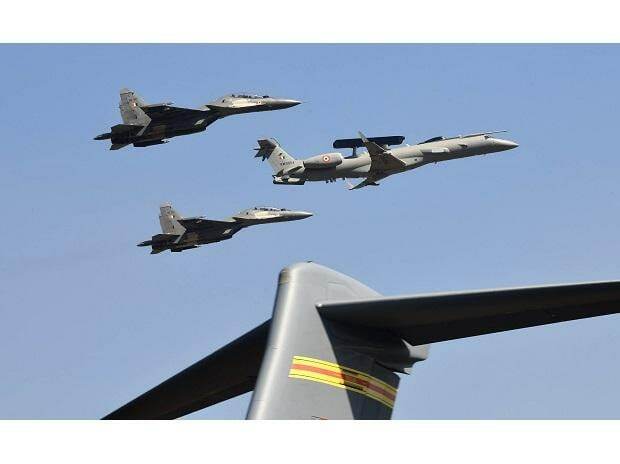 Aircraft rehearse for the Aero India 2019 in Bengaluru. 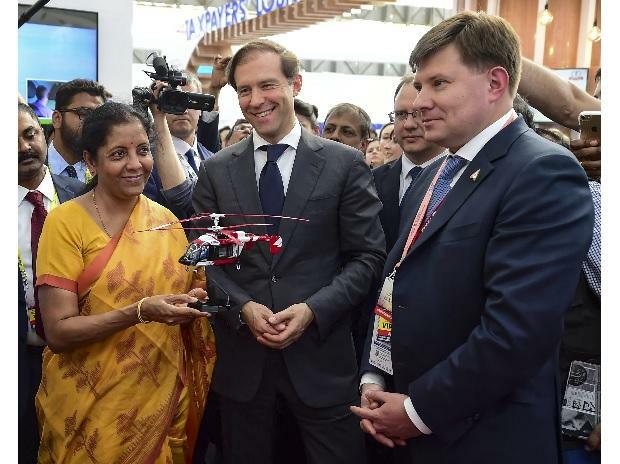 Defence Minister Nirmala Sitharaman, while inaugurating Aero India 2019 in Bengaluru on Wednesday, appealed foreign defence vendors to build and invest in India. The National Democratic Alliance (NDA) government had created an investor-friendly policy environment since 2014, she claimed. Urging foreign “original equipment manufacturers” (OEMs) to build in partnership with Indian defence firms, she promised: “You have an assured market and, in fact, a captive buyer in the Indian armed forces”, she said. Seeking to dispel the widespread perception that sluggish procurement resulted in very few orders actually being placed for weapons and equipment, Sitharaman said the government had, over the last four years up to October 2018, signed 150 contracts worth Rs 1,27,500 crore with Indian vendors for military equipment. She also said the government has initiated 154 procurements worth Rs 2.8 trillion under Make in India categories where tenders are issued to Indian vendors. “In the defence ministry we are ensuring that procurement orders are given to Indian vendors, who can tie up with OEMs from different parts of the world who can come here and start producing in India”, said the defence minister. Besides these procurements, Sitharaman said, the private sector got a substantial share of the orders placed on the Ordnance Factory Board and Defence Public Sector Undertakings (OFB/DPSUs). “The volume of production of OFB and DPSUs has gone up from Rs 43,277 crore in 2013-14 to Rs 58,160 crore in 2017-18 Out of this, 40 per cent of production is outsourced to the private sector”, she said. “So when we give the OFB an order, it is definitely a government-run institution, but the order is not at the cost of the private sector. The private sector does get a substantial part of the order and, therefore, there is a happy blending of both the private sector and the public sector under the Make in India programme. Sitharaman also pointed out that 424 private firms obtained defence production licences over the last four years. FDI liberalisation has not enabled large investment inflows. According to the defence minister, total FDI during 2014-18 amounted to Rs 200 crore through the automatic route (below 49 per cent FDI). During this period, only six companies obtained government approval for FDI over 49 per cent, amounting to Rs 237 crore. Sitharaman claimed the government had streamlined defence exports by cutting down the time taken for granting export permissions. According to statistics displayed in the Make in India pavilion, Indian defence exports have grown from Rs 1,150 crore in 2013-14 to an expected Rs 8,000 crore in 2018-19. This includes the export of Dornier 228 aircraft to Mauritius, Dhruv helicopters to Nepal, Mauritius and Maldives, Cheetal helicopters to Afghanistan and radar warning receivers to Russia. The Defence Production Policy of 2018 (DPrP 2018) has an ambitious target of $5 billion in annual defence exports by 2022. Just over four years ago, on February 18, 2015, Prime Minister Narendra Modi, while inaugurating Aero India 2015, spelt out an ambitious agenda for defence production and procurement reform. The NDA’s achievements in this have fallen significantly short of his benchmarks. Over the last five years, defence production has gone up by only one third. Job creation in defence has been equally sluggish. Regarding offsets, Modi had said: “I want our offsets policy not as a means to export low-end products, but to acquire state-of-the art technology and skills in core areas of priority”. Instead, offset policy was diluted in 2016 to allow foreign vendors to select their mode of offset and offset partners. Naturally, most choose to protect state-of-the-art technology and discharge offsets through low-technology manufacture. Nothing has been done in this regard. Indian vendors still bear the handicap of expensive finance. Even so, an upbeat Sitharaman cited policy reform like FDI cap liberalisation, the defence offset policy of 2016, de-licensing of defence items and establishment of a Defence Investors Cell to claim credit for the manufacture in India of assemblies and structures such as the S-92 helicopter cabin, an advanced aircraft cockpit, a glass cockpit for the Dornier-228 and wing pylons for the Chinook helicopter.